Sorry for the page skip! Had some kind of unassailable headache that prevented me from staring at the screen 14 hours a day like usual >__> Better now, and back to work to get the next page up asap. A little new creature entry is up for Patrons since we have a new angry friend, and if you’d like to see the next 4 pages of inscrutable thumbnails, those are up on the Patreon as well. Since I’ve been shirking my stream duties in favor of burying myself in this workhole, will try to do a Patron stream next week as well! I suppose rain equals the processor keeping a close eye on the unfolding events. Also, I’m in favour of clobbering angry!friend. Where’s the rain coming from? Is there some sort of rain-making organic machine? I wonder what that would look like. I imagine the walls of the environment they are embedded into is filled with the required organs to produce the mist/rain. It’s probably literally raining from the roof. The processor has kept tight control for so long for a reason. But Jaws and armsharks are out of the water! Glad to see that Kalla is lending a hand – er, femur-equivalent – to the fight. The bone Bex has been using appears to be part of her elbow, so… the humerus? Wait, were you setting me up for a pun? I don’t find that humerus at all! It wouldn’t be too much of a stretch to see Kalla’s skeleton underneath LEVi’s body as actually holding it down. Still really curious about the nature of that whole incident…I’m sure we’ll find out! LEVi seemed so nice and polite, it probably didn’t put up such a fight as Bex (and now Mike). Heck yeah Mike and Bex team up for a monster battle! Tag him in, Bex! Also, that is a very beautifully illustrated foot/paw in the first panel. I’m noticing some similarities between thighfriend and the Assassin. Maybe the latter is a mature versiom of the former? Or maybe it’s just the kind of similarity that comes from being part of the same ecosystem and evolutionary framework. PS I’m always kind of surprised thighfriend doesn’t impair Mike’s movement more. This creature has striking bear-like paws but its posture in the 5th panel seem to hint that it has no idea how to use them as he’s pushing his weight top-down instead of swiping with the massive claws. This leads me to believe that the Processor clobbered it together from the humans’ memories of Earthly predators which seem not to have existed in this environment prior. (Hopefully this first sentence is vague enough to not defeat the purpose of Patronage..) In the Patreon post Der-Shing shows that these creatures are not meant to have combat as a primary function. I guess they were in the vicinity and the Processor thought them structurally intimidating enough to at least swipe Bex off the cliff or something similarly lethal. Maybe they were meant to double as her “sensible Martian body?” Though it seems like the Processor reincarnates people into freshly synthesized mobile platforms? Yeah, its legs aren’t great at reaching forwards, but it is doing its best. It probably hopes to push Bex into the water where more stabfish can get her. 1. Bex is swinging a club at the new creature. 2. Bex lifts the club out of the water to swing it. 3. Bex is crying or something, and she hasn’t yet noticed the creature looming behind her. 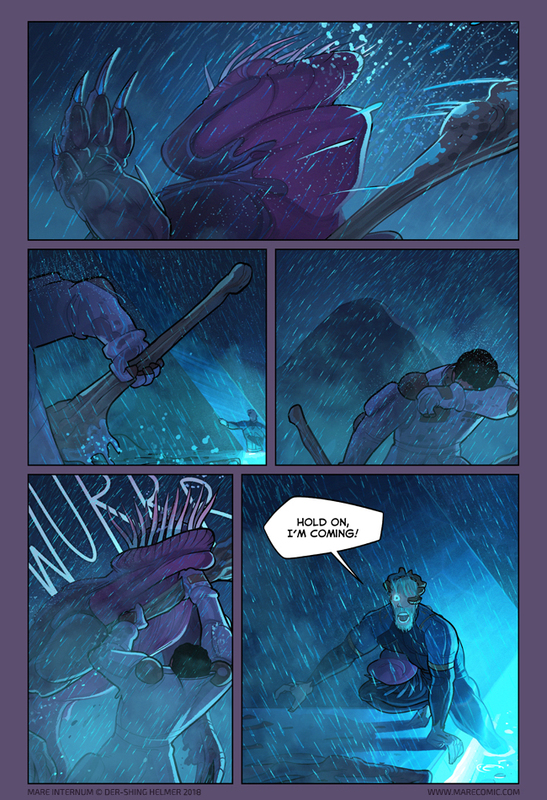 In panel 4, the sequence gets back on track, and Bex is fighting the creature. That’s not crying, that’s using the breather she gained from clobbering the creature to wipe the rain off her face so she can see. There’s a zoom out on the next page to show relative positioning but yeah right now it’s probably like?? how did it get up so fast and run behind her? I assumed it was some sort of Martian wizardry. Thanks for explaining that, Der-shing. wait… how can it be raining if they are underground? and I’d like a better look at the angry friend there.. have we seen him before? I don’t think so but I could be forgetting it. It’s raining violets–I mean bits of Processor. I think everything damp in this place is Processor. Cut to ceiling: Martian nightcrawlers are having their daily urine venting. Best explanation I could come up with, but kinda gross to think about. Doesn’t seem impossible to me! The Martian civilization had the technology to build a subterranean (or rather, submarean) area that can sustain life indefinitely. That area also has the ability to keep itself hidden from Earthlings’ technology, which isn’t too shabby. Adding something to the roof of the cavern to allow rain to be created seems trivial given all that. I think the word would be “subaresean”, since the Mars equivalent to Earth-Terra is Ares. “submarean” would be below the sea, while this takes place above the water. Except subaresean would be ‘below Mars’ – but they’re below ground, which is still simply subterranean. It’s actually very plausible. The easiest way would be to have a sort of sprinkler system on the ceilings. Since we’re talking about bio-engineering here, the ceiling could just be covered with sweat glands embedded in a skin-like membrane. Another, even more plausible way to do it, would be to control the humidity and temperature. Just increase the temperature, then increase the humidity (the waterfalls might do the trick), then drop the air temperature again, and the excess humidity will condense into mist and rain. This actually happened inside one of Facebook’s datacenters a while ago, google for “rain inside datacenter”. a) I was going to comment on the high quality of the paw in panel one, and I see CharlieBoi beat me to it. I agree! The paw in panel one is drawn beautifully! b) It’s true, bear-fungus has a huge opening for attack in panel four. c) It’s good to see Mike engaged with his surroundings and the one person around him. d) I am concerned about Mike’s ultimate fate. He’s been well colonized by Martian flora. Return to the surface may not be possible for him. No, it just wants a hug, damnit! The processor just wants to win you over with kindness! A physical battle is such relief at this point! Yes, another cliffhanger, but . . . So the Processor gets moody, huh? No simple trap door opens and that is that–we have to work it out mano a mano. What happens if the gladiators keep taking out the lions? Will the Processor run out of lions? Will the lions start to obey the winners? I am reconsidering my previous hypotheses about the nature of the Processor and its environment. These methods seem way too crude for the level of sophistication I thought (hoped?) it would possess. Along with the “tomb” hint Shing dropped I start to think it might be something that accidentally survived a now extinct civilization. Or (slightly more optimistic) maybe accidentally left behind by one that left for the stars. Something broken or at least malfunctioning. The name Processor, and the characteristics of its avatars/ drones suggest a biotech computer. The defensive display was sufficiently threatening! Enemies retreat! Well, that was anti-climactic. Lets all take a nap. I made a comment some time ago about how we’ll never see Mike fighting with a piece of Wollarian crest as a sword. I am now very hopeful that I was wrong. Maybe it’s just me, but I don’t think Mike would last long in a fight — having a flapping, thigh-adjacent buddy tapped directly into your bloodstream seems like a major vulnerability…! IDK I feel like thighfriend might be the only reason Mike survives a fight. The biggest surprise on this page? Mole !Friend appears to be pentadactyl! …..Yes…but…. Is Mike coming to help Bex or help subdue Bex? Obviously he is going to help Bex . . . by facilitating her assimilation into a superior and benevolent paradigm. But I really hope Bex *does* die and get poured into a nice new alien body. I mean, really, what could the humans leaving possibly result in that isn’t the imminent destruction and/or exploitation of this place? I see a few ways this goes. A.) The humans leave, tell people what happened, and Earth immediately begins attempts to find and exploit the cavern and its ecosystem/technology. B.) The humans leave, but keep the cavern a secret. This weighs heavily on them and they’d quite possibly mess up or have the information extracted from them anyhow, given the inconsistencies their cover-up story would probably have. C.) The humans stay, and Earth goes looking for them and finds the cavern eventually. D.) The humans stay, and the loss of some of the team results in a major setback that slows down development and exploration. The cavern will, quite probably, be found eventually- and its human nature that that’ll be the beginning of the end for it, one way or another. At least if they stay, it’ll remain peaceful for longer. I’m pulling for Bex. Recall that John Carter was an exaggeration, but she did evolve and live in a 1g field for most of her life. In just under .4 of that, our little biologist is a gorram Amazon.